I did not set out to have my ignorance about certain baseball-related topics shatter into a million pieces. I did not set out to have two completely different venues shatter my rose-colored view of my baseball ways. But, it happened. And, I was all the better not knowing any of it. Allow me to explain. Last weekend, my wife and I went shopping and stopped by Books-A-Million to see what they had (in general, but also for my son who has required summer reading for school). 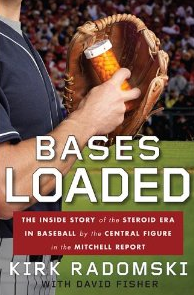 On the dollar rack, I saw "Bases Loaded" about the steroid era. It was a buck, so why not? The book sat in my home office doing nothing for a few days before I started reading it. In the meantime, I finally broke down and started entering hundreds of cards into TheCardCollector - to see if I needed them or already had them. By "hundreds," I mean more than 2,400 cards in 800-count boxes. I am down to one 800-count box and a box of cards and items I thought I had already done. That should be fun (insert sarcastic eyeroll here). During a break from collecting, I started to read the book. I hate it. It tells me all the things I knew were going on, but was blissfully ignoring. And that was all of the first 20 pages. I quit reading it. Frankly, I don't want to know what I don't know. I'd rather not know which of the baseball "heroes" I looked up to took part in the juicing, the womanizing, etc. While entering cards, I discovered that some of my sets were showing as having inventory (that is, I had the cards already in my collection), but the names of the players were stricken from the system for those sets! AUGH! Now, I have several sets that show I own cards but they have no names. For example, my 1994 Conlon Collection cards. Now, in some sets, this is not a big deal. I can look up the card numbers and names either online of in the few Baseball Almanacs I have. But, the Conlons are different. See, in the program, the cards are listed from 1-whatever. However, the ACTUAL cards are numbered starting with about 600 and going up. So, the card with ID# 51 might actually be card #723 in the set. The program "handles" this because the people who made the program preface the cards with their actual numbers. So, Card 51 might look like: Card 51 #723 Robert Feller Qty Owned 1 - That is, when everything was still there. Now, the program joyfully shows: Card 51 Qty Owned 1. Lovely. What actual CARD NUMBER is #51!? I have no idea. This means I now have to go through the database looking for missing names, then hit the binders and look up the actual cards to re-enter the names into the database. AUGH! Oh, I know, it sounds like I'm whining. I suppose I am a little, but I am very exasperated. Many of the missing names belong to sets that I added myself because they were not originally in the database program. Well, after the company ADDED those sets, it unceremoniously deleted the player names from the sets I had created. I am just very lucky that it kept the inventory tracking. Otherwise, I'd be looking at starting all over again and building up to my now 10,250+ cards and items. Having said that, I am curious about those that keep their cards in a spreadsheet - or their own database. Would you mind sharing the file or the layout? I figure I better have a backup plan in case this turns into a "start over from scratch" situation. So, there it is... I now know more than I wanted to about the "behind-the-scenes" of baseball, and I am fully aware that my card database may no longer be valid. I want my ignorance back. Thanks. I have several baseball books to read (over two long shelves worth) but you won't find any steroids books in there because I'm not sure I care to know the story either. I picked up a copy of Juiced the other day and put it back down. Maybe in a few years I'll be interested in it, but for now there's plenty of other baseball books to read. I used to use the Card Collector software back in the 90s. I think I was one of the first to use it. In fact, I believe it was a DOS program at first before it migrated to Windows. Now I use spreadsheets through Google Docs. You can see how I track various types of collections through my want lists (http://thiscardiscool.blogspot.com/p/want-lists.html) (the links take you directly to my spreadsheets). As a set builder, you'd be more interested in the Base Sets and Baseball Sets links (the percentage calculations on the Baseball Sets links are all formulas). The best way to see how I handle team sets is the Team USA link, and individual cards (say for a player collection) aren't linked there, but a similar format could be used from my Non-Sports spreadsheet. If you have questions about any of those let me know, or "what if I wanted to" questions. I've thought about reworking the spreadsheets to include a little more data, so your questions may help spawn those ideas. I'm thinking that my solution lies somewhere in a mix of the two suggestions. I have a Zistle account I've never used. Exporting that info to a Google spreadsheet sounds VERY appealing. I export mine now, but I have to seriously massage it to get it readable by humans. Of course, the thought of keying in 10,300+ items all over again makes my head spin. Haha! I read Game of Shadows just for curiosity. The main thing I got out of it was what was claimed as the motivation for using steroids. Zistle is very good for exporting lists into a spreadsheet. You can export your entire list, or just by set. My only complaint is that the database is not yet complete because it is user driven. If you have some cards that are not already in the database you will have to manually add them in. Fortunately there are quite a few users who are working hard to fill in the missing holes. As a past user of Card Collector (I have a 2006 version and used one from 1992) I can tell you that if you are working on sets and have your cards sorted it is a whole lot easier to add them to your collection in Zistle. You can also see what other collectors have the cards you want and work out trades very easy. I have completed 2 trades and they worked very well. Pack-searching exploit - Good, Bad or Who Cares? 4-Buck Oddball Pack Break Coming Up! (Mail Day)^2 + TonT = Fun Tribecards Time! So you like free stuff? How's this for a contest?